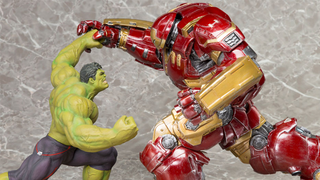 Age of Ultron really, really wants you to know that the Hulkbuster is awesome, judging by the amount of toys and merchandise it's racking up ahead of the film's release. But honestly, if it means we get something as cool looking as this set of statues, I'm not going to complain. Bring on the Hulkbusting! Lovely. Each statue cuts a rather impressive scale too - the hulk comes in at around 9.5 inches, while the Hulkbuster comes in at 11.5 inches. You'll want to clear some shelf space to fit the damn things on if you want them! Alas, if you're fond of giant statues of things about to beat the crap out of each other, you'll have to wait a bit before you can get your hands on these - no price or release date has been confirmed for either statue, but I'm imagining 'expensive' and 'in time for the movie' to be the case for them. Ultron's assault on your wallet continues.